I am super excited about this recipe. Can you believe it? I can only because I made it. Like. Really. Plus I think this Candida diet is really starting to work. I am starting to feel very energetic again...........I woke up before all 3 kids and felt rested. At ten to 6. Rested enough to get out of bed when I didn't need to. God is answering my prayers. Its a great day. And it actually smells like spring for the first time. Hallelujah! I didn't actually think this recipe would work - or not this well - I was just trying to use up some leftover roasted squash. But it was amazing. My husband wants it again for supper tonight. He had no idea what it was made of. You can not tell the key ingredient is spaghetti squash. Seriously. And we could pick it up and eat it like a "normal" piece of pizza. This is momentous for this family. Pizza is sacred to my husband. 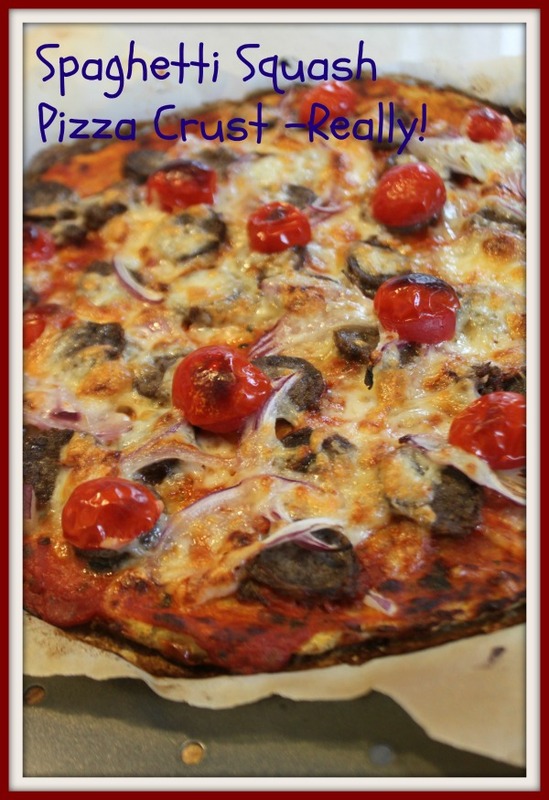 We also LOVE the Wheat Belly Cookbook Pizza Crust #1. But given its made from almond flour its not the most low calorie or low fat option out there. I'm lucky to not be watching calories right now because I'm breastfeeding but hubby doesn't really like that it is 200 calories a slice just for the crust. Plus I like to save my nut intake for snacks. So this is an awesome alternative that will be a new staple in our house. 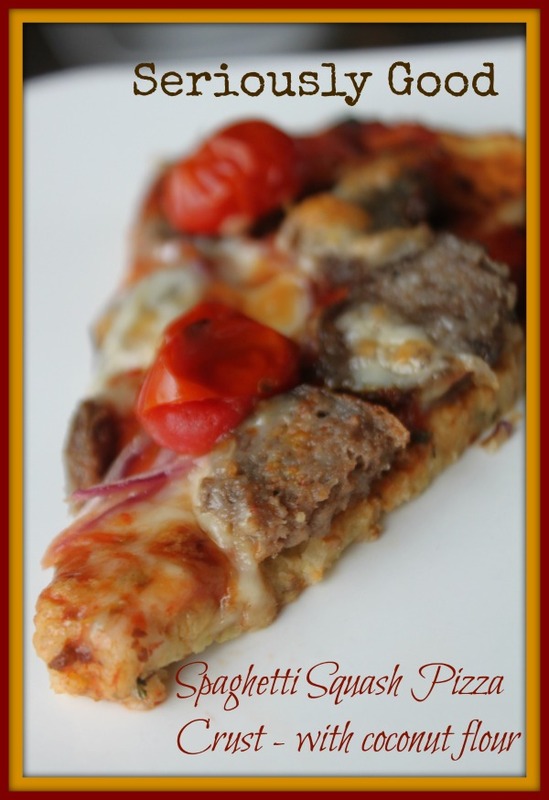 It is low-carb, wheat-free and even Candida friendly. Well, my version of the Candida diet allows 2 - 3 ounces of mozza 3 times a week so I am safe if I watch my intake. I suggest you roast the squash in advance and let it cool completely. I used half a squash for one crust. To roast your squash. Cut it in half lengthwise. Remove the seeds. Place cut side down on a baking dish. Bake for 1 hour at 350 degrees. Preheat oven to 400 degrees. Line a pizza baking pan with parchment paper. Strain your squash in a colander or sieve squeezing out as much of the water as you can. Place in a bowl and add egg and mozza cheese. Combine. Using the back of a spoon, spread the mixture on the parchment paper. Mine was about 1/4 inch thick. Bake for approximately 30 minutes. Keep an eye on it to make sure the bottom is not browning to quickly. Adjust temperature and time as needed based on your oven and baking sheet. Add pizza toppings and bake for another 15 minutes. I topped this with a tomato sauce made from mixing tomato paste with canned coconut milk and spice, some grass fed nitrate and sugar free sausage, onions, cherry tomatoes and a little mozzarella cheese.